Erie County is a metropolitan center located on the western border of New York State covering 1,058 square miles and consisting of 3 cities and 25 town governments. It has almost a million residents. 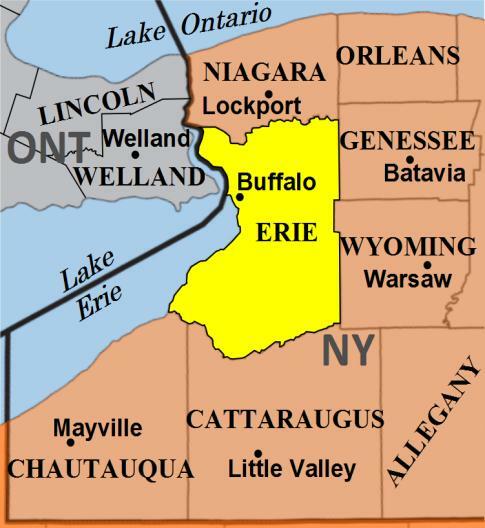 The County is bounded by Lake Erie to the west, Niagara County and Canada to the north, Genesee County and Wyoming County to the east, and Cattaraugus and Chautauqua Counties to the south. It is home to countless museums, galleries, restaurants, shops, professional and college sports teams and more than a dozen colleges and universities. The City of Buffalo is the second most populous city in the state of New York after New York City with a population 265,000 and is the principal city of the Buffalo Niagara Falls metropolitan area. The City itself is home to two of three SUNY Buffalo campuses, the Buffalo State College campus, the City campus of Erie Community College and the Buffalo Niagara Medical Campus. 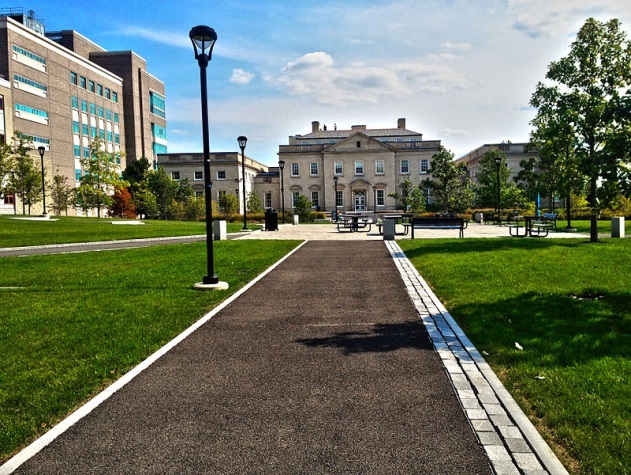 Other higher education institutions (4 year+ and 2 year) within the County include a third SUNY Buffalo campus, two additional ECC campuses, SUNY Empire State College, Bryant & Stratton, Canisius, D’Youville, Daemen, Hilbert, Medaille, Trocaire and Villa Maria. Total 2011 Fall enrollment at higher education institutions in Erie County exceeded 76,000 students. The Town of Amherst has been named the safest town in America several times, ranked 42 in a list of 100 Best Places to live in America by CNNMoney.com in 2012 as well as many other accolades. Its school districts have consistently rated among the best in New York State. Amherst is home to Daemen College, SUNY Buffalo Amherst campus, and both Medaille College and Canisius College have satellite campus classrooms in Amherst. The Town of Cheektowaga is one of the largest suburbs and is rated in the top 25 safest communities in America. Buffalo Niagara International Airport, Villa Maria College, and Empire State College are located here. The Town of Clarence was the first township founded in Erie County and has lots of green space and parks. It is also home to Antique World, a huge indoor/outdoor antiques and flea market. Colden/Glenwood/Boston villages are home to Erie County’s ski slopes, Colden Tubing and Kissing Bridge. East Aurora has a charming village center and is home to Fisher-Price Toys and the Toy Museum, Moog and Elbert Hubbard Roycroft Museum. Grand Island is situated on the Niagara River between Buffalo and Niagara Falls and is one of the world’s largest freshwater islands. Beaver Island State Park is a waterfront park with golf, bike trails and beaches. Buckhorn Island State Park is an 895 acre nature preserve. Cannon Design architecture firm is headquartered on Grand Island. The Town of Evans located in Southern Erie County has a wealth of natural, recreational and scenic resources, including the Lake Erie shoreline, which runs for approximately 12 miles between Evangola State Park to Eighteen Mile Creek. Six public parks provide access to Lake Erie including Sturgeon Point Marina, Wendt Beach Park, Bennett Beach, Evans Town Park, Lake Erie Beach and Evangola State Park. Other assets along the waterfront in the Town include the Frank Lloyd Wright designed Graycliff Estate, and numerous areas where the waterfront views are available such as Purvis Landing, a small picnic access site with parking. The Town of Hamburg is located on Lake Erie and home to the Erie County Fairgrounds and “America’s Fair”, the third largest county fair in the country. There is a bustling village center, Hilbert College, Hamburg Raceway and Woodlawn Beach, one of the area’s largest public beaches. The Town of Tonawanda is located on the Erie Canal and Niagara River. One of the town’s best known landmarks is the blue Korean-War era Grumman F9F-6P Cougar Naval airframe at the Walter M. Kenney Field. Outdoor enthusiasts enjoy the Isle View Park for biking, hiking, fishing and boating. The City of Tonawanda is home to Gateway Harbor, a public park that runs along the Erie Canal just before it joins the Niagara River, with a free dock at the park. The City of Lackawanna is the location of the nation’s first urban wind turbines. Our Lady of Victory Basilica is the second oldest basilica in the country with Italian religious architecture. Boardwalks and bikeways border Lake Erie and Gallagher beach is popular with windsurfers and kayakers. The Town of Lancaster is also designated as one of the safest communities in the country and the easternmost suburb in Erie County. There is a lot of historical architecture in the village and plenty of farmland. The Town of Orchard Park has sprawling farms and green space. Ralph Wilson Stadium is the home of the National Football League’s Buffalo Bills. Bryant and Stratton College and Erie Community College are also here. The Town of West Seneca has an extensive system of recreational facilities including 15 town parks, indoor skating rink, swimming and youth community center and a large soccer complex. Charles E. Burchfield Nature and Art Center is located here as well as a 7.2 million dollar state of the art Southtowns Family YMCA facility. Governor Andrew M. Cuomo has further propelled opportu­nities with his commitment of $1 billion in economic development monies for Buffalo, consisting of direct funding, tax breaks, and cheap power, as well as his recent announcement of “Start-Up NY,” a bold initia­tive to change the State’s high-tax reputation. It encourages the growth of new jobs by estab­lishing tax free zones on State University of New York (“SUNY”) and community college campuses. Compa­nies that locate on campus will be able to grow their business without paying sales, property, business, or corporate taxes. With five SUNY locations throughout Erie County, the County stands to benefit a great deal from this exciting new proposal. While the region continues to undergo significant economic and demographic transformation, one constant remains – its strategic location. From the 1825 completion of the Erie Canal to the international border with Canada to current connectors such as major railroads, international bridges, state and federal highways, international airports and ports, the region continues to play a critical role in moving goods, expanding global trade and creating prosperity. Access to key population centers also is important to the region’s success. Located 500 miles from 41 percent of the US population and 59 percent of Canada’s with access to 25 percent of the world’s fresh water, Western New York is poised to take advantage of its many assets and strengths – such as a tourism sector with international acclaim; relatively low costs of living and doing business; an educated and skilled workforce; and strong aggregate household income. Moreover, grassroots, non-profit, and neighbor­hood leaders throughout the cities, towns, and vil­lages in Erie County are successfully reviving local commercial corridors in the heart of each commu­nity, rigorously promoting the important advantages of supporting local businesses, and giving a louder voice to our treasured assets. These individuals and institutions (some with national recognition) are also increasingly linked to and partnering with local gov­ernments throughout the County to serve the com­munity and creatively address challenging problems. The remarkable success of the National Preservation Conference held in Buffalo in October 2011, as well as, of the Building Alli­ance for Local Living Economies Conference held in June 2013 are demonstrations of this work. Each of these is an example of the changing environment of Erie County. Furthermore, the concept of sustainability has gained a foothold in Western New York. Previous brown field sites (like Buffalo Lakeside Commerce Park, Buffalo RiverBend, Spaulding Fibre, and Bethlehem Steel) have been or are ready for remediation. These efforts continue as New York State Energy Research and Development Authority and U.S. Department of Housing and Urban Develop­ment offer communities the opportunity to compete for tens of millions of redevelopment dollars for the presentation of a thorough, innovative, and collaborative sustainability plan for their region. Additionally, municipalities and private developers continue to create new business and commercial parks such as the Airborne Business Park, Colvin Woods, North Youngmann Commerce Park, and Riverview Solar Technology Park. Three clusters in particular stand out: advanced manufacturing, health and life sciences, and tourism. Advanced manufacturing - Despite erosion in recent decades, manufacturing remains the third-largest employment sector in the Buffalo Niagara economy, representing 50,000 employees, $6.3 billion in GRP (11% of the total) and the area’s two largest export sectors. Exciting growth potential exists in the materials, machinery and metals and chemical segments, serving key industry sectors such as renewable energy, medical devices and pharmaceuticals, where Buffalo Niagara has a well concentrated base of firms and workers. Ceramics materials manufacturing is notable here, with unusually strong concentration in the region, and prospects for nearly 7% annual growth through 2020. It also benefits from a high-performing local base of chemicals suppliers, as well from university based research at University at Buffalo and Alfred University that should spur advances in clay, rubber and plastics. Machinery and chemicals manufacturing (already the region’s largest export sector) feature superior productivity and appear poised to build on this edge. Health and life sciences - The region has invested heavily in both health care and life sciences, especially in the Buffalo Niagara Medical Campus (BNMC). BNMC currently has over 8,000 employees that will grow to more than 17,000 with the co-location at BNMC of the SUNY Buffalo School of Medicine, Millard Fillmore Hospital, Women and Childrens Hospital of Buffalo, and the world renowned Roswell Park Cancer Institute creating a critical mass of health science service, research and commercialization. Tourism - Visitors travel from all over the country and the world for the outstanding art, architecture, history, theater, culture, professional sports, and parklands—bringing $1.5 billion in tourism spending annually to Erie County. Niagara Falls attracts 8 million visitors annually, more than most U.S. national parks, and nearly double the draw of the Grand Canyon. Amateur athletics is also a major driver of tourism in Erie County, with 52% of the business booked by Visit Buffalo Niagara related to such events. The region has played host to competitions sponsored by NCAA Basketball, USA and NCAA Hockey, NCAA Swimming and Diving, ESPN Bassmas­ters, and the International Ice Hockey Federation as well as countless other tournaments and meets at the scholastic level. Additionally, construction of the HAR­BORcenter project downtown promises to bring even more amateur hockey to Buffalo. Known as the father of landscape architecture, Franklin Law Olmsted’s work in Buffalo is just as noteworthy. The Buffalo Parks System was the first of its kind in the United States - a visionary attempt to create islands of tranquility amid a growing city's tumult. Connected by a series of bucolic parkways and broad avenues lined with elegant homes, Buffalo's parks system remains an extraordinary urban amenity. The New York Times recently called Buffalo "home to some of the greatest American architecture of the late 19th and early 20th centuries" and on another occasion "a textbook for a course in modern American buildings." Notable architects represented include Frank Lloyd Wright who designed six homes in the Buffalo area; Louise Blanchard Bethune, known as the first American woman to have worked as a professional architect, who designed the Lafayette Hotel; and, Louis Sullivan and Dankmar Adler who designed the Guaranty Building, which is now called the Prudential Building. Buffalo Niagara is being recognized nationwide on a growing list of acco­lades that demonstrate an important change in how Western New York is perceived: in 2010 Forbes Mag­azine called the region the 10th best place to raise a family; in 2011 Relocate America placed Buffalo Niagara among the top 100 best places to live and The Business Journals reported that Buffalo Niagara had the nation’s 18th strongest private sector job growth; and in 2012 the National Association of Home Builders ranked our region among the most affordable major U.S. housing markets. Western New York has independent school districts with several ranking among the top in New York State. The City Honors School, located in the City the Buffalo, is consistently ranked among the top high schools in the country by sources such as Newsweek and U.S. News & World Report. The region is home to a major medical school, a nationally ranked cancer research center, 17 hospitals and many more specialized centers. The region has 3 major hospital systems Erie County Medical Center, Kaleida Health and Catholic System Health. The area has increasingly become a center for bioinformatics and human genome research, including work by researchers at the University at Buffalo and the Roswell Park Cancer Institute. The Buffalo Niagara Medical Campus is a world class, 120 acre medical campus in downtown Buffalo. It also includes: Buffalo Hearing & Speech Center, Buffalo Medical Group Foundation, Hauptman-Woodward Medical Research Institute, Kaleida Health, Olmsted Center for the Visually Impaired, Cleveland Bio Labs and Upstate New York Transplant Services. 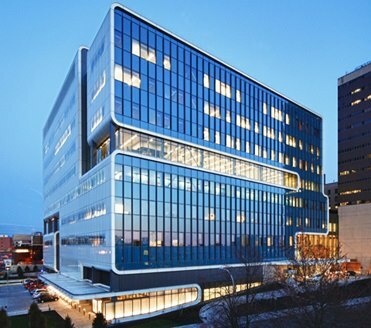 A $291 million combined facility includes the Gates Vascular Institute and University of Buffalo’s Clinical and Translational Research Center. Located next to the Buffalo General Medical Center, the facility brings Kaleida Health physicians and SUNY Buffalo researchers together to join in the advancements in care and treatment, development of new medical technologies, discovery of breakthroughs and the spin off new biotechnology businesses and jobs. UB 2020 strategic plan is focused on constructing a new home for the School of Medicine and Biomedical Sciences in downtown Buffalo, advancing UB’s strength in the biomedical sciences and other research fields and increasing the university’s economic impact in Buffalo. Roswell Park Cancer Institute is a comprehensive cancer research and treatment center. The facility is involved in drug development and conducts clinical research for cancer treatment. Erie County is served by the Buffalo Niagara International Airport, located in Cheektowaga. The airport serves over 5 million passengers a year and is still growing. Buffalo Niagara International Airport ranks among the five most affordable airports from which to fly in the country, according to the U.S. Bureau of Transportation Statistics. The Niagara Falls International Airport is a joint civil-military public-use airport located four miles east of the central business district of Niagara Falls, in Niagara County, New York and has three active runways, which serve both general and military aviation. Public transportation in Erie County is provided by the Niagara Frontier Transportation Authority which owns and operates Buffalo Niagara International Airport as well as an extensive bus and light rail transit system. Freight service is served by CSX Transportation and Norfolk Southern, as well as Canadian National and Canadian Pacific (railroads from across the Border). The area has several large rail yards including Frontier Bison, SK and Buffalo Creek . The Port of Buffalo is a major U.S. Port of Call encountered when entering the Great Lakes. Its central location within 500 miles of the major population and distribution centers of the Northeast and North Central States, and within 500 miles of 75 percent of the Canadian population, makes it ideal for industry and distribution. The region’s assets include world renowned architecture, historic parkland, and thriving arts and cultural insti­tutions. Specifically, the Albright-Knox Art Gallery, the Buffalo Museum of Science, and the Buffalo History Museum are all celebrating over 150 years in this com­munity. During recent years, major investments have been made to renovate the Frank Lloyd Wright’s Darwin Martin House and the H.H. Richardson Complex. 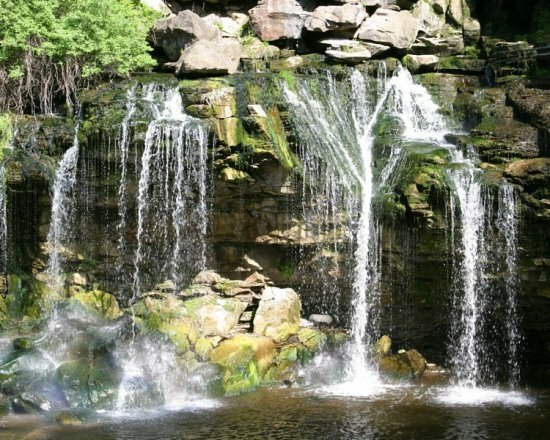 Erie County is also blessed with a beauti­ful parks system, which includes diverse landscapes ranging from heavily forested areas to waterfront beaches; 11,000 acres of land spread throughout 38 sites in the County. The County’s parks support many different activities including hiking, biking, sledding, snowmobiling, cross country skiing, fishing, boating, swimming, and more. The Erie County Parks System, first established in 1925, is also historic with five parks including Chest­nut Ridge, Ellicott Creek, Akron Falls, Como Lake, and Emery parks designated as “Heritage” parks by Erie County’s Parks Master Plan. Some features through­out these five parks were built during the Great De­pression as part of the Work Projects Administration. Street festivals, including the Allentown Art Festival, Elmwood Festival of the Arts, and Juneteenth Festival of Buffalo bring thousands of people to browse and purchase original crafts. The Buffalo Philharmonic Orchestra, which performs at Kleinhans Music Hall, is one of the city's most prominent performing arts institutions. The Buffalo Theater District, with over 20 professional companies include The Alt at the Warehouse, American Repertory Theater of Western New York, Brazen Faced Varlets, The Irish Classical Theatre, The Kavinoky Theatre, Lancaster Opera House, The New Phoenix Theatre, Road Less Traveled Productions, Shea's Performing Arts Center, The Subversive Theatre, The Theatre of Youth, and Torn Space Theatre. One of Buffalo's many monikers is the City of Trees, which describes the abundance of green space in the city. The Olmsted Park and Parkway System is the hallmark of Buffalo's many green spaces. Three-fourths of the city park land is part of the system, which comprises six major parks, eight connecting parkways, nine circles and seven smaller spaces. The Olmsted- designed portions of the Buffalo park system are listed on the National Register of Historic Places and are maintained by the Buffalo Olmsted Parks Conservancy. The Buffalo Sabres (NHL hockey) play in the City of Buffalo. 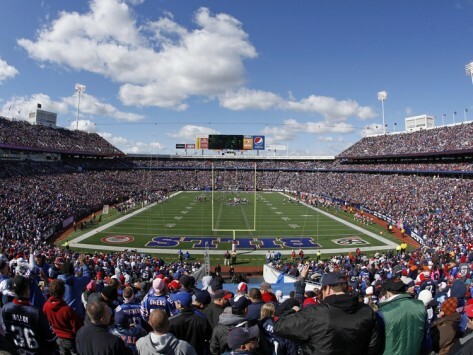 The Buffalo Bills (NFL football) play in the suburb of Orchard Park, New York. Buffalo is also home to several minor sports teams including the Buffalo Bisons (baseball), Buffalo Bandits (indoor lacrosse) and FC Buffalo (soccer). Several area colleges and universities are active in college athletics.